Preheat oven to 350°F. Grease and flour 12-cup fluted tube pan or 10-inch tube pan. Beat 2 pkg. cream cheese, the granulated sugar, egg and 1 tsp. of the vanilla in medium bowl with electric mixer on medium speed until well blended; set aside. Prepare cake batter as directed on pkg. ; pour half of the batter into prepared pan. 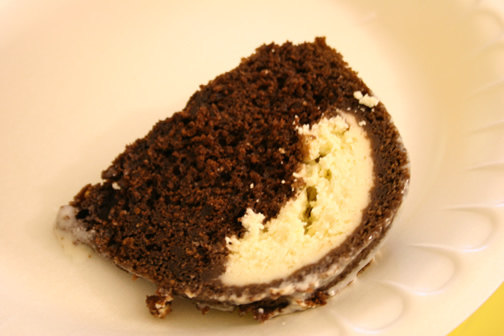 Spoon cream cheese mixture in ring around center of cake batter; cover with remaining cake batter. Bake 45 min. or until toothpick inserted near center comes out clean. Cool in pan on wire rack 30 min. Loosen cake from side of pan; invert onto serving platter. Cool completely. Beat remaining 1 tsp. vanilla, the powdered sugar, 2 oz. cream cheese and the milk with wire whisk until well blended. Drizzle over cake. Let stand until set. To make cupcakes instead, line 24 medium muffin cups with paper liners. Prepare cake batter and cream cheese mixture as directed. Spoon 1/4 cup of the batter into each cup; top with 1 Tbsp. of the cream cheese mixture and an additional 1/4 cup cake batter. Bake 20 to 22 min. or until wooden toothpick inserted in centers comes out clean. Cool 10 min. Remove from pans. Makes 24 servings, 1 cupcake each. I am so glad to find this recipe. I was trying to explain to my daughter just a few days ago about the bundt cake mixes you used to be able to buy. Now I can make one. This looks so delicious!! 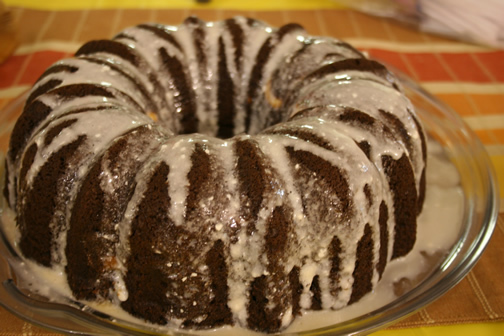 If you want to make this a healthier recipe, you can always substitute the oil in the cake mix with applesauce. Thank you for this blog!! My daughter and I have enjoyed exploring the recipes and ideas you have posted! !